I have an overlay tile size of 1680 x 1050, which matches screen size. When the map moves to a new extent I was expecting to see just one request of the WMS Server, but instead I see four requests to the WMS Server. The Buffer Size is zero. Each of the four requests have unique coordinates. What do you think might cause four requests to be sent? Have you log the four request url? We can compare them and see what's the different. Below is a set of four url's. As I watch the WmsRasterLayer render it actually will draw in four sections. If there are three url's the map will draw in three sections. It looks the four parts merge to the tile image you need. I think the reason should be because zoomlevel is not the same between client side and server side, for render the target scale, the target size is not enough to cover all map, so it require four parts from deeper scale and merge them into one image and resize it. So I think you can check the zoomlevel set to see whether the client side is the same as server side. and maybe you can try to require bigger size to see whether it can avoid sent multiply request. What you've explained sort of makes sense. However, how is the ZoomLevel on the WMS Server made the same as on the client? I've tried various zoom levels on the client and it does not change the number of requests. 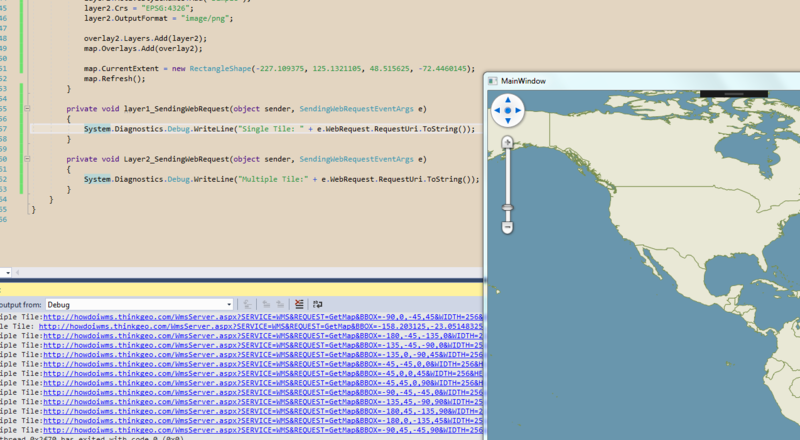 I also changed the TileSize on the client to 4096 x 4096 and it still makes two requests and takes 90 seconds to render. What is confusing is that it is the client sending in the four URL's and the Local WMS Server simply sends those same requests on to the Remote WMS Server. So it is the client that generates the requests. What controls the number of requests being sent by the client? I think about more about this, because it's a WMS layer, so your client side should get the capability from server side, and the capability should contains the target zoomlevels information. In fact I am not clear about how you implement your client side, but the request number should be controlled by the client JS library, and I think if the JS library found the tile size is not enough for cover all map, it will cut it and sent multiply request. That's why when you set 4096 x 4096 the tile number reduce to 2 from 4. So I think maybe you can did some research about the JS library to see whether it contains some property about set request number or close some possible feature which support map render more area than render requirement. The client is WpfDesktopEdition using WmsRasterLayer. You might recall that I have a local WMS Server that then passed the request to a remote WMS Server. The GetCapabilites from the local WMS Server does not contain ZoomLevel's. Does the JS Library apply to WpfDesktopEdition? If so where is that library located? Do you have any code snippets that demonstrate how any of this is accomplished? Thanks for your remind, I thought you are using web forms as client side. 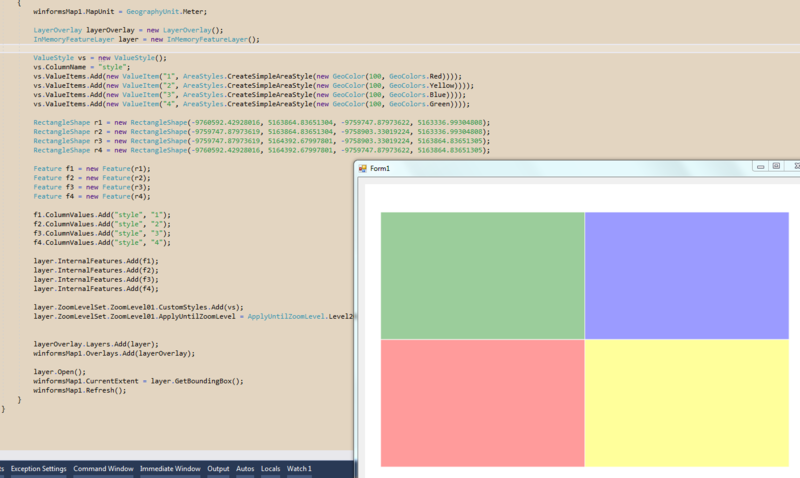 If that's wpf edition, I will take some time to looks into the code and see whether I can find where is the problem. Please wait my later reply. I build a simple sample, and found when you set the layerOverlay.TileType = TileType.SingleTile it only sent one request. If you cannot set the tile mode equal single tile, I think you can try to modify the sample to reproduce that and we can discuss how to solve it. Setting TileType=Single does indeed result in a single request to the WMS Servers. After seeing it in operation I now understand why there are multiple requests when TileType=MultipleTile. MultipleTile is multi-threaded resulting in multiple requests to the WMS Servers, which allows the rendering to begin immediately and take place a section at a time. There is a side-effect with TileType=Single, which is that the map does not begin to render immediately. It only renders after the entire extent is composed, which is single-threaded. I much prefer TileType=Single, but it takes 3-4 seconds for the extent to be rendered which is slow to the users. The WmsRasterLayer is contained within its own LayerOverlay. The remaining local layers are in another LayerOverlay. With the LayerOverlay WmsRasterLayer TileType=Single and the LayerOverlay for remaining layers TileType=MultipleTile the entire rendering is single-threaded. I was hoping that only the LayerOverlay used for WmsRasterLayer would be single-threaded, but that's not the case. One of our customers, with only 50% of their workstations in production, generates 300,000 WMS Server requests per day. Once deployment is 100% there may be as many as 500,000 WMS requests per day. This is putting a strain on our third-party WMS Provider. I'd like to find a solution so that only one WMS Server request is sent with the other LayerOverlay's rendered by multi-thread. I would like to work with you to find a solution to this dilemma. At some point I'd like to engage ThinkGeo about how to get better response times for TileType=Single. The problem is, even if we find a way to make multi-thread only sent one request, that also means the multi-thread only have one thread, and it's in fact the single tile mode. Because one request need to wait the same time from server side. The solution should be find a way to make the response speed too faster, so it's a problem between server side and client side. I remembered you used cache in server side, so if multi-thread is faster than single tile mode, that means maybe it's not a network problem, please double check your server side logic to make sure whether the cache works. I've proven that if any LayerOverlay is set to SingleTile then all LayerOverlays operate as SingleTile. When I set the LayerOverlay to SingleTile there is only one URL request sent to the WMS Servers. The production network is 1GB and the Internet connection to our third-party WMS Provider is very large so we are not faced with a network issue. Caching is not used because the third-party WMS Provider can install new imagery at any time and we don't have to be aware or do anything special. If caching were being used the system would use old cached images instead of new imagery. I actually prefer SingleTile mode since the extent displays all at the same time. The problem is that it takes 4 seconds to render and that is too long. I'd really like to see the render time as 1-2 seconds. Just like I mentioned, one tile for multiply mode equal single mode. It looks the performance bottleneck is in your server side, I remembered it's a traffic station. So maybe you want to do enhancement like this, your client side choose single mode, you add some logic in your server side, split the request to some part for example split one extent to four parts, sent them to the really web service multiply thread, merge them in your server side and sent that back to client side. It looks a little complex, so that's just a suggestion. The local WMS Server is actually not a bottleneck. The issue is sending four requests to the remote WMS Server for each extent. The goal is to send only one request per extent (based on TileBuffer of course). What I realized today is that of the four requests being sent each has a size of 1680x1050. This really does not make sense to me if four requests are being sent. It would make sense to me that each of the four requests would have a size that corresponds to the area of the extent that they each are going to render. Seems to me a lot of extraneous requests are being sent. Why can't one request be sent of 1680x1050? This is a real issue for customers that have high traffic systems. It looks this problem is a little confused, let's think about the scenario again and found where is the problem. Please let me know if I missed any point. Your scenario is 3 parts, the A part is client side, it's a WPF application, the B part is your server side, it get the request from A and sent that to C, the C part is 3rd part WMS server, you cannot control it. Now the A sent multiply request, for example 4 requests to B, and B sent also 4 requests to C, you want to reduce the number of requests from B to C.
If you choose single mode in A, the speed is about double than multiply mode. You think the A to B is not the bottleneck. So your requirement is, reduce the request number from B to C, and keep the render time in A. If that's correct, it's not easy to solve. Because I think why the multiply mode is faster than single mode, that's because it's multi-threaded when sent request from B to C(A to B without bottleneck which means multi-threaded or not cannot save time in this process), if you want to reduce the request number from B to C, that means the using time have to increase. So this contradiction cannot be solved, more requests get faster and less requests get slower between B to C.
In fact single tile mode still get faster, because it save some area which is not in current extent. So if your A is not a single user, I still suggest you create a cache system in B, if different A user request the same part, B don't need to get from C again. If the data from C keep get changed, you can make the cache expired in fixed time period, so it make the B looks like a cache server of C.
Wish I hadn't miss any important information. My goal was to reduce the number of request coming out of the client as that then reduces the number of requests down stream. However, unless ThinkGeo rethinks rendering and allows both single and multiple LayerOverlays to operate independently this is not a path to follow. As you've seen from my other post I'm going to implement caching and that will solve a good deal of the problem. But reducing the number of requests out of the client would also be a benefit for caching. I'd like to see ThinkGeo allow different Tile Types to co-exist and would also like ThinkGeo to address rendering times in both Single & Multiple Tile. I understand what's your problem, but I think your test result maybe incorrect about single tile and multiply tile. I build a sample here, you can see the single tile works well with multiply tile just like it is designed. Please let me know if your code have some different with the test scenario. I've done more testing with the WmsRasterLayer LayerOverlay set to SingleTile and the other LayerOverlay's set to MultipleTile. The SingleTile and MultipleTile LayerOverlay's do indeed render independently. However, when a request is made to move from one extent to another the MultipleTile LayerOverlay does not begin to render under the SingleTile LayerOverlay also renders so a delay of 2-3 seconds occurs and then the entire map is rendered all at once. When a pan is performed it appears the MultipleTile LayerOverlay renders first, but is bogged down so to speak by the SingleTile LayerOverlay and again the panned-to section of the map is then rendered all at once. I'm going to first implement caching and then come back to this issue and see if it is still a problem area. Thanks for all of your assistance on this. OK let's talk about it after cache problem, in fact I hadn't watched it in my simple sample, maybe we need more detail information about how to reproduce it and see whether it's a bug.